Pen Hir Diamant is a spicy triple beer of great quality that was created especially for Le Comptoir Irlandais by the Brasserie du Bout du Monde. Specially created for Le Comptoir Irlandais, Pen Hir Diamant is a triple breton beer with a touch of spicy flavours. It rested underground for 5 months away from the elements and time. 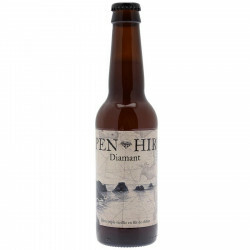 The showcases that allowed this beer are Scottish whisky oak casks from the Aberdeen area. Pen Hir Diamant has been tested twice by an independent laboratory: once out of fermentation tanks and once out of barrel. These tests ensure a high quality and allow to obtain the best brews of the Brasserie du Bout du Monde located in Finistère in Brittany. Quality and time for an exceptional beer! Colour: light and fleeting foam, fine bubbles, coppery color. Nose: very open and complex. Candied fruits, malt, mango, banana, vanilla, wood, spices. Palate: sweet attack, generous and greedy texture, notes of bananas, candied fruit, malt. Length in the mouth long and heady. Finish: slightly bitter, herbaceous, spicy, woody.